I have been there only once and for just a week. It had always been on a someday list for me – not a bucket list task necessarily, but a frayed string tied around a finger, reminding me that a visit there was important, and likely to resonate. Like many, I have always been drawn to the coast, although I don’t care much for letting go of the shore to venture out on a boat. That experience is disconcerting, like riding the liquid ground of an earthquake. Nothing to grab onto; no emergency brake. The coast, however, is altogether something else. Raw and changing, while at the same time steadfast, it sings a siren’s refrain. Maine was like that for me. Heavy skies pressing down, bleeding darkly; boats bobbing, throbbing with color, slave to the tides. Rocks framing everything, creating a distinct and forbidding boundary between the heaving tides and the shore. Jutting, diving, emerging wet and colorful. I have not removed the string. *All images shot in Tremont, Mt. Desert Island, Maine. Driving east from Ketchum back to Idaho Falls for flight home from the Rockies trip, we experienced one final treat – we stopped right at sunset at Craters of the Moon National Monument. There were few tourists, other than the handful of campers parked and buttoned up for the night. A three-day weather system was moving off, and bone-chilling cold was right behind it. 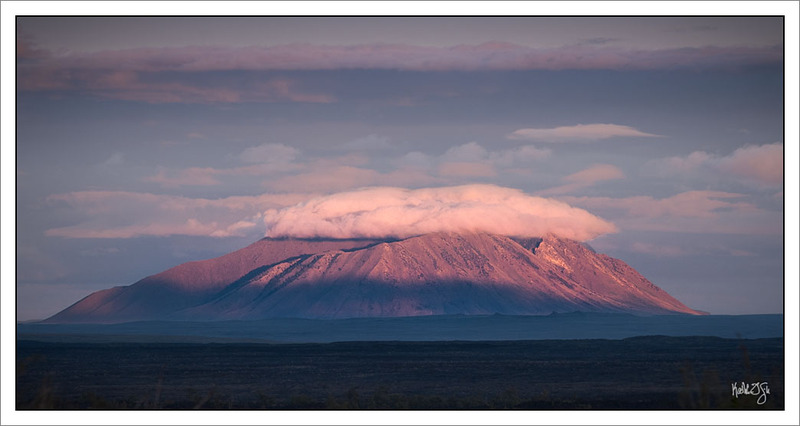 From the park, many miles across the lava fields, you could see Big Southern Butte with its own cloud/fog cap. Glad I had a telephoto and tripod for this one.